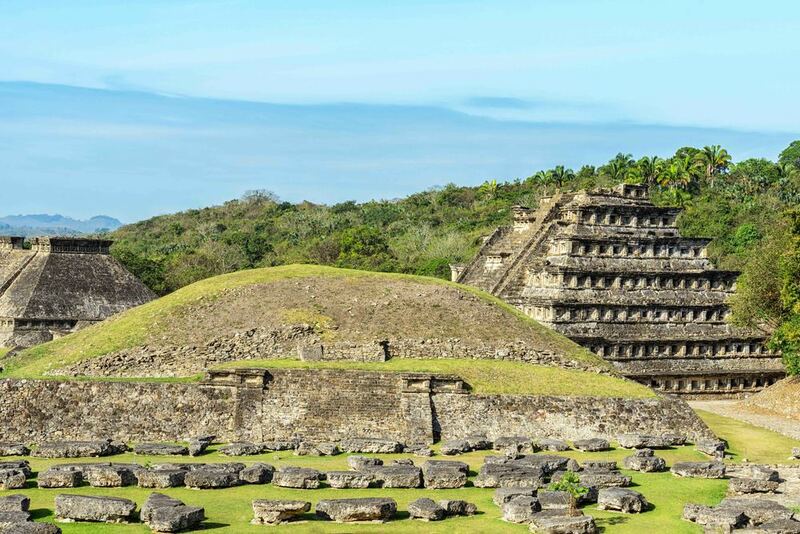 El Tajín was named a World Heritage site in 1992, due to its cultural importance and its architecture. This architecture includes the use of decorative niches and cement in forms unknown in the rest of Mesoamerica. 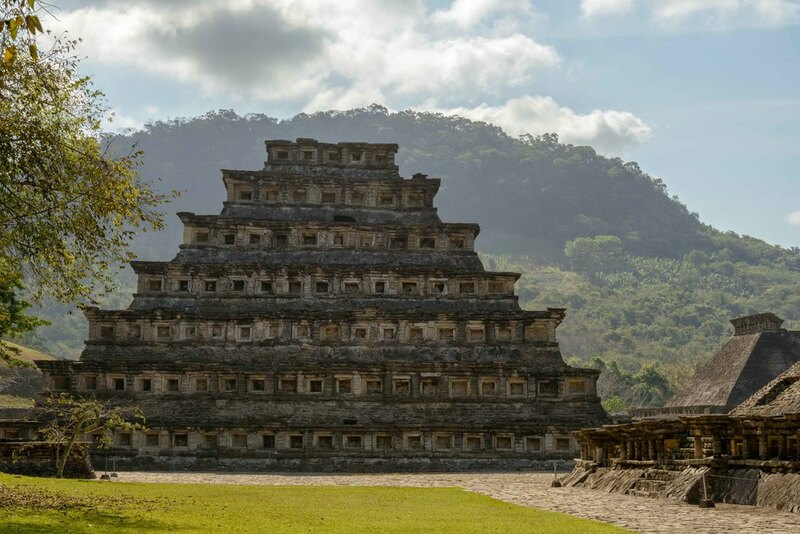 Its best-known monument is the Pyramid of the Niches, but other important monuments include the Arroyo Group, the North and South Ballcourts and the palaces of Tajín Chico. In total there have been 20 ballcourts discovered at this site, (the last 3 being discovered in March 2013). Decoration at the entrance to Tajin. The ball game court known as "Juego de Pelota de Venus". Tajin is the site with most courts in Mesoamerica. It has 20 (the last 3 being discovered in March 2013), an extraordinary example is the south ball game court. View from the the Arroyo Group to the Pyramid of the Niches. This pyramid has as a number of names including, El Tajín, Pyramid of Papantla, Pyramid of the Seven Stories and the Temple of the Niches. It has become the focus of the site because of its unusual design and good state of preservation. It was prominent in ancient times as well. Paintings at the ball game court "Juego de Peloa de las Pinturas", on side of the Pyramid of the Niches. The building is mostly constructed of carefully cut and crafted flagstones, the largest of which is estimated to be about eight metric tons in weight. The stones, especially around the niches are fitted together as to need a minimum amount of lime and earth mortar. The structure originally was covered in stucco which served as the base for paint. The pyramid has seven stories. 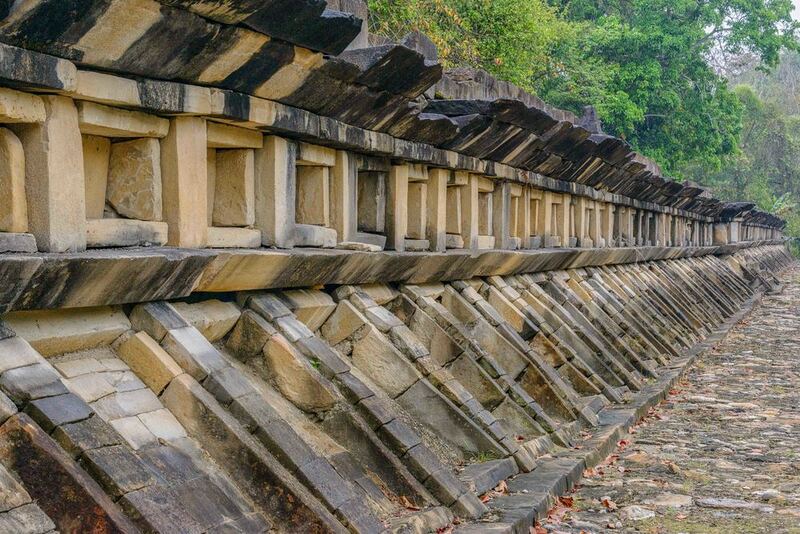 Each of these consists of a sloping base wall called a talud and a vertical wall called a tablero, which was fairly common in Mesoamerica. What is unusual about this construction and others in the city are the addition of decorative niches with the top capped by what Jose Garcia Payon called a “flying cornice,” a triangular overhang. The stones are arranged in controlled lines and delicate proportions. Originally the structure was painted a dark red with the niches in black intended to deepen the shadows of the recessed niches. Niches are also found underneath the stairway along the east face, which indicates that the stairway was a later addition. The niches on the original structure, not counting those on the later stairway, total 365, the solar year. At the top of the pyramid there were tablets framed by grotesque serpent-dragons. View from Tajin Chico over the ball game court "Juego de Pelota Norte" and "Plaza del Dias Tajin". View from Tajin Chico to the Pyramid of the Niches, in front parts of the ball game court "Juego de Pelota Norte" with staircases. Tajin Chico is a multilevel portion of the site that stretches north-northwest from the older parts of the city up a hill. Much of this section was created by using massive amounts of landfill. Paintings in one of the small temple structures of Tajin Chico. The entire exterior of the building C in Tajin Chico is covered in stepped frets, with these frets arranged to give the appearance as niches. To further this effect, the inside of the frets were painted dark red and the exterior portion light blue, similar to turquoise. This complex is known as the Great Greca (Fret) or Xicalcolinhqui. The wall is in the from of a spiral, or stepped fret, is the image of the truncated seashell indentifid with the Good Quetzalcoatl, who is also associated with the wind and movement. While the fret, or Xicalcolinhqui, is a common decoration in the architecture at Tajin, the construction of a monumental fret could have been an effort on the part of the rulers to fortify their domain in the face of a social crises. The Blue Temple has some features that set it apart from other pyramids at the site. Except for six benches on the staircase and at the top of the balustrades, probably later additions, there are no niches. Close up of beheading on one of the panels of the South Ball Court at Tajin. The stairway to the temple of the Pyramid of the Niches is adorned on the sides with frets, which are called Xicalcoliuhqui. It is thought to symbolize lightning and while it is common in Mesoamerica, it is a very prominent motif here. These frets were probably painted blue as they were on other buildings, where remains of paint have been found. At the top of the stairway were probably two large three-dimensional stelae. Building 5 is considered to be the stateliest of the El Tajin site. While located next to the Pyramid of the Niches, its visual appeal is not lost to its more famous neighbor. It is located in the center of a pyramid complex and consists of a truncated pyramid rising from a platform that is over 32,000 square feet (3,000 m2) in size. Between the two sets of staircases on the first level on the east side is a tall column-line sculpture.